Concentrated intensive conditioner reduces the activity of sebaceous glands as well as effectively and permanently removes oiliness, hence the hair remains fluffy, clean and fresh for longer. 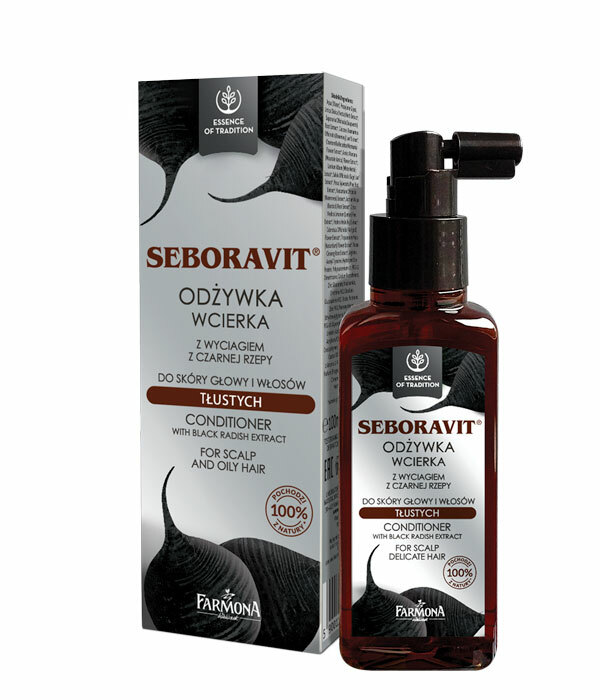 Double concentration of natural black radish extracts regenerates hair and inhibits hair loss. Burdock root extract has anti-inflammatory and antibacterial properties, effectively eliminating the development of bacterial flora, responsible for the formation of dandruff and seborrhea. In addition, the extract from fresh rhizome of calamus reduces the activity of sebaceous glands, strengthens and nourishes hair roots and improves blood circulation in the scalp. Provitamin B5 soothes irritation and itching of the scalp, gives hair a beautiful shine, lightness and fluffiness. Rub a small quantity of conditioner to damp or dry scalp. Do not rinse. Use every other day. Shake well before use. Extract from black radish, burdock root extract, extract from rhizome of calamus, provitamin B5.